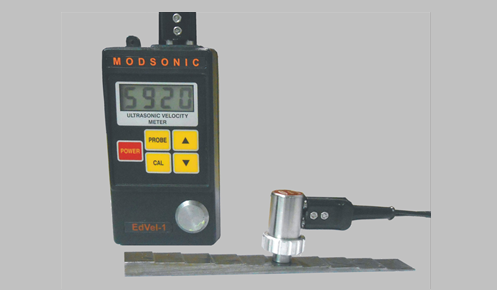 It measures sound velocity in the homogenous material whose thickness is known. Ideal for segregation of casting parts based on percentage modularity. Probe Zero Adjustment Couple probe on Instrument probe zero block then Press Probe Switch. Material Velocity Measuring Range 1000 to 9999 metre/sec. Material Velocity Linearity:Metric 2 to 25 mm = 51 m/sec. 25 to 300 mm = 26 m/sec. Power Supply Two 1.2V AA Ni-Cd batteries or Dry cell. Auto Shut-Off 3 minutes after switching on/last reading.